Okay, we realize that not everyone wants chrome and flashy stuff on their car. Unfortunately, for those who don't like chrome, sometimes the manufacturer has made the decision to put chrome on their vehicles from the factory. That's where we can step in and help you out to give you that custom look you want. 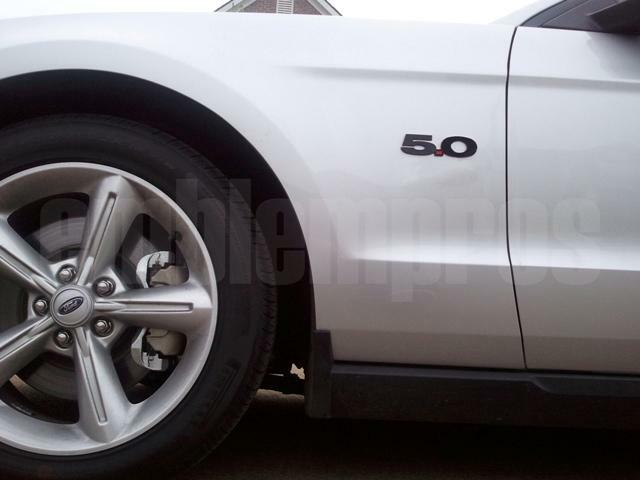 This is our 5.0 replacement emblem set (1 for each fender) for your 2011 - 2012 Mustang GT. These are made from thick, solid color plastic. They are nearly the same thickness as the OEM 5.0 emblem. Our emblems are laser-cut for precision and they can be used as 100% direct replacements for any factory badge on your car, or engine cover. On this emblem, the face is flat; not beveled like the factory molded piece. We also have a recessed "." like the factory emblem does. You get to choose the color of the "5 0" and the "." - so, you can color-coordinate these emblems to your car's paint and stripe scheme. For example, you can get a red "5" and "0", but a white "." if you have a white car with red stripes. The options are pretty vast.